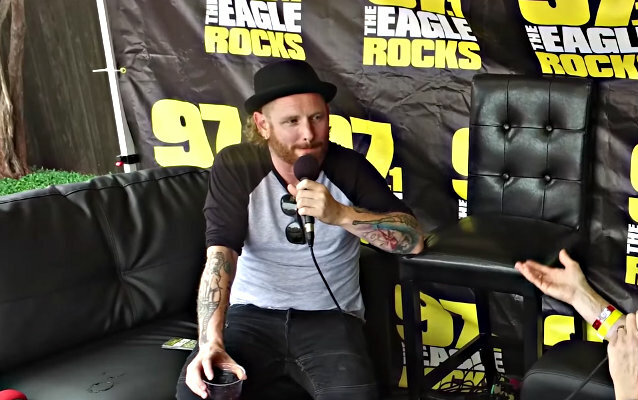 SLIPKNOT and STONE SOUR frontman Corey Taylor was interviewed by 97.1 The Eagle's Cindy Scull at this year's BFD festival, which was held May 28 at the Starplex Pavilion in Dallas, Texas. You can now watch the chat below. Asked about the current status of SLIPKNOT, Taylor said: "We're not really doing anything right now. I know we're kind of slowly starting to write some music. Other than that, we're just kind of taking some time off. Clown's gonna direct some movies, Sid's gonna do some stuff… We're all kind of doing our own thing… But that's it. I mean, really. Next year is everybody kind of doing their own thing, and then probably after that, we will slowly but surely start to get together to do some SLIPKNOT stuff." SLIPKNOT's touring cycle in support of its latest album, 2014's ".5: The Gray Chapter", ended in November, with Taylor returning to his other band STONE SOUR this year. One of last gigs of "The Gray Chapter" touring cycle saw SLIPKNOT performing its 2001 second LP, "Iowa", live in its entirety for the first time during the band's set at their annual Knotfest.